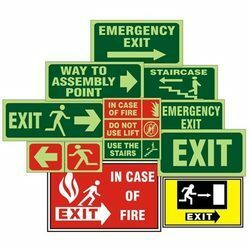 Leading Manufacturer of safety signage and glow sticker from Thane. Safety Signages offered is made available in Sunboard thickness of 3mm & 5MM, it's also available in stickers format. With the aid of our technologically advanced production unit, we are able to offer Glow Sticker at economical prices.